The original version of this article appeared on the International Reporting Project website. Nicholas Aster, founder and publisher of San Francisco’s Triple Pundit, covered sustainable development in Kigali, coffee’s empowerment potential, and eco-tourism sites like Volcanoes National Park. Aster also became interested in Rwanda’s efforts to avert disaster by corralling Lake Kivu’s CO2 reserves into a power supply. At the close of his trip, Aster reflected on Rwanda’s sustainability goals in a photo essay. Tom Paulson, host and reporter for KPLU’s Humanosphere, discovered the positive side of aid and development in Rwanda, including girls’ education initiatives and coffee farming improvements. Moreoever, Paulson documented the Gatekeepers’ trip to Volcanoes National Park, including a visit from a mountain gorilla who became a little too friendly. Paulson has also posted several questions the Gatekeepers asked President Paul Kagame when they met with him, including his policies on restricting free speech, curbing population growth, and preventing another genocide. At the close of the trip, Paulson composed a photo slideshow that shows a growing, vibrant Rwanda, and he also outlined 10 reasons why the complex and sometimes contradictory country can’t be described in a sound-bite. Sue Horton, op-ed and Sunday Opinion editor of the Los Angeles Times, began chronicling her trip with a survey of Rwanda’s history on genocide, governance, and gorillas. On the road to meet Rwanda’s famed gorillas, Horton noted Rwanda’s strengths and challenges: its ambitious vision for the future encourages a growth in infrastructure and the country has showed impressive gains in healthcare provision and access, but Kigali is relocating residents who don’t fit the image. The deputy managing editor of Global Post, Andrew Meldrum, also found a note of optimism in witnessing how far Rwanda has come since the genocide, particularly after hearing the testimonies of the genocide’s youngest victims: children born of sexual violence during the genocide. And his Global Post colleague Jon Rosen delves into the country’s population growth and the government’s approach to family planning. In addition to the Gatekeeper Editor Trips, the IRP offers individual Fellowships to U.S. reporters to travel overseas on five-week reporting trips. In 2009, IRP Fellow Perry Beeman discovered a Rwanda similar to that which the Gatekeepers encountered: a country that has made much progress, but still has many challenges ahead. Beeman, who also was a public policy scholar at the Woodrow Wilson Center, created a multimedia series, “Renewal in Rwanda”, for The Des Moines Register; his reporting garnered him an Overseas Press Club citation for Best Reporting in 2010. Rwandans, Beeman found, are dedicated to conservation. President Kagame is committed to the environment and is driven to develop clean, sustainable power and to convert from subsistence agriculture to a stronger, more diversified economy. But everyone has a hand in this effort, including schoolchildren who report on conservation in song, dance, and dramatic arts. Beeman also examined efforts to preserve the Gishwati Forest, including gorilla and chimpanzee preservation efforts from villagers to businessmen to researchers. Beeman emphasized the importance of immersing oneself in an environment in order to report on it, and he did so by, among other things, tracking wild chimpanzees in the forest. For more information about IRP’s Fellowships and Gatekeeper Editor trips, visit their website at InternationalReportingProject.org. 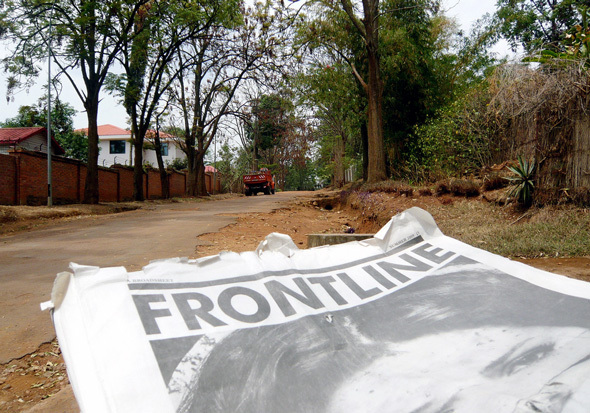 Photo Credit: “The Broadsheet in Kyovu, Kigali,” courtesy of flickr user noodlepie (Graham Holliday).